Get 2 Free Issues of All You magazine. All You is commonly known as the Coupon Magazine. 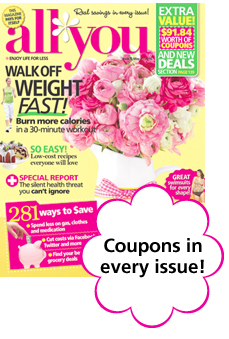 Each issue contains over $50 in coupons. July has over $56, but I normally see over $70 or $80 (the front cover states how the dollar amount inside). All You is offering a 2 issue Free Trial. If you like it (and I know you will), you can receive 10 additional issues for $19.90. This includes the 2 trial issues, making it $1.65/issue. If you want to cancel, simply mark cancel & return the bill. You get to keep the 2 free issues no matter what. I love this trial, because it allows beginning couponers to find out how much they will really save. The only place you can buy AllYou is at Walmart for $2.66/issue.